Wang has been charged with "defection" and abuse of authority. The Chinese term for the crime of defection is a combination of treason and flight. Plans to file the treason charges were first reported by the Free Beacon Aug. 16. China’s government appears to have timed the trial to coincide with the visit to Beijing by Defense Secretary Leon Panetta. Observers say the timing suggests Chinese officials are sending a political signal to other potential defectors who, like Wang, might seek to cooperate with the United States, a country portrayed daily in state-controlled media as China’s main enemy. Wang set off China’s biggest political scandal in decades on Feb. 6 when he sought refuge at the U.S. Consulate Chengdu, in southern China, after fleeing the neighboring city of Chongqing and his former boss, Communist Party regional chief Bo Xilai. After 33 hours inside the consulate, Wang was turned over to China’s Ministry of State Security and disappeared from public view. Chinese officials revealed after the attempted defection that armored personnel carriers had been sent from Chongqing to Chengdu as part of a plan by Bo to use force against the consulate if needed to prevent Wang from defecting. Inside the consulate, Wang provided documents to U.S. officials and also revealed that Bo Xilai and his wife Gu Kailai were behind the murder of British businessman Neil Heywood, who was found dead in a Chongqing hotel last November. 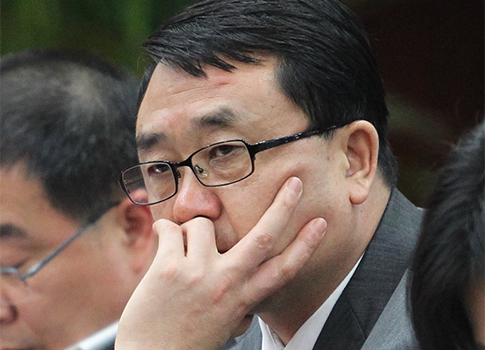 In a high-profile political case, Gu and an associated were convicted of the murder. Four other Chongqing police officials were also convicted of covering up the crime. The Wang trial is viewed as the final step prior to the Communist Party’s potentially most unsettling move—the possible arrest and imprisonment of Bo Xilai, who until Wang’s attempted defection had been slated for promotion to the Politburo Standing Committee, the nine-member collective dictatorship that rules China. U.S. officials have said Wang sought political asylum while at the embassy but his appeal was rejected by senior Obama administration officials, including officials within the office of Vice President Joe Biden, who were concerned that granting the defector’s request would upset relations with China, including the impending visit to the United States by Xi Jinping, China’s next supreme leader. White House officials later denied that Biden or his office influenced the U.S. decision or that President Obama took part in deciding the defector’s fate. The president was informed of the defection, they said. Rep. Ileana Ros-Lehtinen, chairman of the House Committee on Foreign Affairs, initially asked for an investigation into the apparent mishandling of the defection and asked to see all State Department cables and email on the incident. Ros-Lehtinen, however, later declined to comment on the outcome any briefings on the case or committee activities related to the affairs. Wang was initially to be tried at an open judicial proceeding in Chengdu but authorities closed the hearing claiming the case involved state secrets, Associated Press reported from Chengdu. "It was closed according to Chinese law because it involves state secrets," Wang’s defense lawyer Wang Yuncai told the news service. The public hearing for the trial is set for Tuesday and large numbers of news reporters have traveled to Chengdu to observe the proceedings. Chinese authorities initially said tickets for seating at the hearing would be available but later said that none were available for the general public. In the past, such charges against a former official almost certainly would result in a death penalty. However, Wang, because of his role in identifying the murder of Heywood by Bo’s wife, is now expected to receive a lengthy prison term instead. A former high-ranking U.S. intelligence officials, Kenneth deGraffenreid, has said the administration’s mishandling of the Wang defection is "a major intelligence and policy failure—the loss of a potentially valuable source on a regime whose internal politics remain opaque to us, despite the $100 billion we spend on the intelligence community." This entry was posted in National Security, Politics and tagged Bo Xilai, China, Communist Party, Ileana Ros-Lehtinen, Joe Biden, Leon Panetta, Wang Lijun, Xi Jinping. Bookmark the permalink.